I should probably preface this review by saying that I'm pretty sure that I'm not the target audience for THE BAKER CREEK VEGAN COOKBOOK: TRADITIONAL WAYS TO COOK, PRESERVE, AND EAT THE HARVEST by Jere and Emilee Gettle (with Adeena Sussman). While my husband and I occasionally try our luck with our small backyard garden, we rarely have enough output to make entire dishes. It seems like the rabbits end up eating more than we do. In addition, I am not a vegan... although I am drawn to the recipes because they often "work" for my son who has loads of food allergies. However, I still liked the idea of this cookbook and I was interested in seeing the unique recipes. For those of you who are like me and not familiar with the authors, Jere and Emilee Gettle are the co-founders of The Baker Creek Seed Company -- "America's Tops Source for Pure Heirloom Seeds." They have written another book called THE HEIRLOOM LIFE GARDENER which is a comprehensive guide to cultivating heirloom vegetables. This time around, they have written a cookbook which features some of their favorite recipes using their locally grown food. THE BAKER CREEK VEGAN COOKBOOK is a very special cookbook and ideal for those of you who are vegan or for those of you who want to incorporate more vegan recipes into your repertoire. The information (both the educational items and the recipes) is presented in a user-friendly format; and the only drawback I can see with this cookbook is that there aren't photographs. You know how I love looking at the finished product! This cookbook is divided into the following chapters: Canning and Preserving, Kitchen Staples (what you need to keep on-hand for baking and cooking), and then the Recipes. While I have personally never canned any veggies, I have fond memories of my grandmother doing this all summer long; and I do know that the practice is once again on the rise. Because so many of the Gettle's customers are showing an interesting in canning, they have provided detailed instructions on the process. In addition, there is some guidance of freezing and drying/dehydrating. While I enjoyed reading this section, I'm still not entirely convinced I have it in me to do this much work! Naturally, my favorite part of the cookbook was the recipes. There are more than 125 vegan recipes featuring all different types of ethnic foods; and I do think many of them looked very good. I am very anxious to try the Apple Fritters (which my son can even eat!) as well as the Spicy Kale Chips (super nutritious and super easy.) In addition, there are a number of main dish meals that sound interesting along with all of the rhubarb recipes (Rhubarb Crisp, Rhubarb-Strawberry Soup with Basil and Balsamic Vinegar, and Rhubarb Limeade.) We planted two rhubarb plants this year, so next summer I will be looking forward to trying all three of these recipes! As someone who doesn't live the vegan lifestyle, I have to admit that some of the recipes and ingredients were a little out there for me! I'm honestly not sure where I'd even find a few of the items here in Central PA -- maybe Wegman's or a health food store. It wasn't that there were a lot of recipes that didn't appeal to me though; and in fact, I'd probably try anything in this cookbook if someone else prepared it for me. 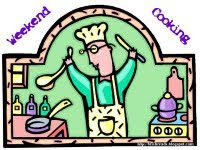 However, some of the recipes were a little more work than I have the time for right now. 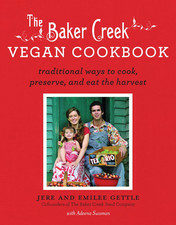 Overall, I appreciated THE BAKER CREEK VEGAN COOKBOOK and wouldn't hesitate to recommend it to gardeners or vegans! I know what you mean about central PA and trying to find some ingredients. I know quite a few gardeners who incorporate vegetarian or vegan meals into their regular diet. This would make a great gift. I don't think I'd mind a vegan dish from time to time but don't think I could follow a vegan diet. The spicy kale chips you mentioned sound pretty darn good! I agree, the kale chips sound wonderful. Actually, you mentioned several recipes I would like to try. This cookbook would probably not get used too often here, but I do want to check out their seed catalog. I'm like you - I want photos of the food I'm supposed to make! But I bet this would be a good cookbook to have on hand if you have vegan friends. Thanks for sharing!